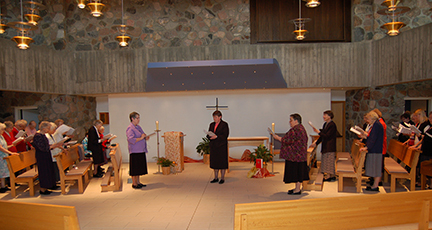 Sister Kerry O'Reilly, President of the Federation of St. Benedict, installed Sister Nicole Kunze as the ninth prioress of Annunciation Monastery on May 20, 2016. Sister Nancy Miller served in this position for the past eight years. and in love, you gave us your Son to be our guide. Give us now your Spirit of wisdom. and who continue to respond to your call. Give Sister Nicole Kunze trust and faith. I’d like to start with a story I have borrowed from Father Eric Hollas of St. John’s Abbey in Minnesota. He serves as the deputy to the director of advancement at St. John’s University. Teaching is a profession that I’ve done my whole life up to today. I admit there are times I’ve taken teaching students for granted, but I have had moments, just like that mail clerk, where I’ve said to myself how lucky, how privileged I am to do such a thing. Many of you have been teachers at some level for some period of time, however short or long that time was. Others of you knew you were not called to be teachers in the formal sense of the word – being in front of a classroom, making lesson plans, grading papers – but we are all called to be teachers to others in some way, shape or form. I think teaching can serve as a good analogy for our Benedictine way of life. In the prologue of the Rule of Benedict, Saint Benedict speaks of establishing a school for the Lord’s service. Each member of this monastic community sought to become a student in that school when she walked through the monastery doors the first time. If the monastery is a school, who is the teacher? Ultimately, Jesus Christ is the teacher, but we need someone here with us. Saint Benedict states that the abbot or prioress holds the place of Christ in the monastery. Benedict devotes one whole chapter early in the Rule, Chapter two, to the qualities of the abbot/prioress. It is quite the chapter, 40 verses reminding the prioress what she has been called to do and how she is to act. When I asked a prioress from another community if she could recommend a book for me to read as I prepared to enter office, she said “Read the Rule. That is all you need. Notice how many times the abbot/prioress is mentioned.” She was right. The abbot is mentioned in many other chapters. None of us made it this far in life with the help and guidance of only one teacher. I believe the same is true in the monastery. We are all called to be teachers to each other. We help each other on this path to Christ. We teach by word and probably even more, by example. We are all members of a family, a group, the world community, and we are called to teach each other what it takes to be a loving human being. If we are all teachers in this monastic community, we need a guide, a syllabus if you want to extend the classroom teacher analogy. Every course has outcomes that should be met by the end of the semester. Last fall, we considered and endorsed a vision statement that stretches us, that defines a desired future state for our community. In our vision statement, we call ourselves to live our charism, mission, values, and guiding principles faithfully. By doing this, we will continue to invite and accept new members to join us in our mutual search for God. We also want to find additional ways to collaborate with others to further the work of the Church and build up the kingdom of God. Before each class, I knew what content I wanted to cover, what skills I wanted to introduce before the class ended. That is what I see our direction statements being, the specific goals we want to work at during the next four years, the short term goals that will help our vision statement become reality. We still need to refine the specific objectives and strategies, but we raised up leadership, membership, community life, ministries, and sponsorship as the five main areas we want to concentrate on. In this analogy, we have focused on the teaching aspect, but a teacher needs students. We are called to be grateful life-long students, too. Our monastic formation did not end with our final initial formation class, however long ago that was. Whether young or old, we have something to learn from each other. I believe that somewhere on our list of “Why did I join Annunciation Monastery?”, to be a part of a community that supports, challenges, and loves me would be there. I would not be ready to take on the role of prioress without the ways you have helped me grow during my years in community. Saint Benedict introduced the idea of the school of the Lord’s service in the prologue. In the next to last chapter, Chapter 72 on the Good Zeal of Monastics, he talks about how the sisters are to live with each other, the good zeal. Let me read a few verses: “They should each try to be the first to show respect to the other, supporting with the greatest patience one another’s weaknesses of body or behavior, and earnestly competing in obedience to one another. No one is to pursue what she judges better for herself, but instead, what she judges better for someone else.” The last verse of this chapter, the verse used on the installation invitation and program, sums up what we are seeking: “May Christ bring us all together to everlasting life.” How do we get there? Everything that is in the Rule in between the prologue and chapter 72 help us with that. The reading from Paul’s letter to the Colossians also provides us with advice regarding how we live with each other in community. We know from experience that kindness, humility, patience, and forgiveness can carry us a long ways. Together we will teach each other and learn from each other as we continue our journey as Benedictine Sisters of the Annunciation.